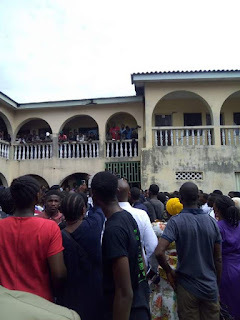 There was pandemonium at the Joint Admission Matriculation Board(JAMB) office located at Lagos-Island Ikoyi over Correction of Data, Changing of Institution and Courses on Thursday, June 1th. Jamb candidates across the state (Lagos) who wanted to correct one or two things were seen storming the office for correction of data, changing of course and institutions. They were to pay the sum of N 2,500 to banks for this service after generating a Remita Retrieval Reference(RRR) pin from their jamb profile which would be required at the jamb office to effect the change. This exercise was learnt to be done across the states jamb offices alone. This has lead to multitude turning out for this service daily. Crowd was seen to have bombarded the place due to poor service as the exercise took much of their time due to few systems on desk. 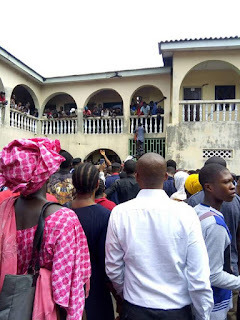 The jamb officials only operate with few systems (computer), causing delay, as many candidates were seen queuing for their correction of data and changing of course and institutions. The queue which was in two phase; show at first, where you pen your name and generate a number which you would use for the next phase to enter the office where these changes would be made. It was surprisingly learnt that among candidates queuing to put down their names, there evolve bribery as some candidates were seen to have collected some amount of money from their colleagues who are willing to find their way to the front in other to quickly generate a number and move on to the next phase. It was learnt that on Tuesday, 30th of May, some set of people said to be student union stormed the jamb office protesting on the hardship candidates go through while some aggrieved ones(protesters) tried to damage the organisation properties. 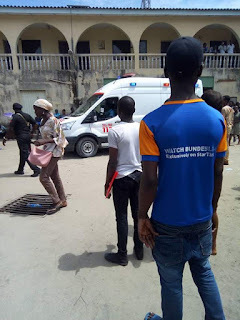 The quick intervention of security men curtailed their destructive act and also made them fled from the scene as the police restore back peace. The police still make it a duty to parade the environment of the office the next day to curtail unforeseen threat that might still come up as they restore peace permanently. The poor service being render by the jamb officials have made many candidates go through rigorous and unnecessary stress as it cause many time, money and even energy without progress in the exercise due to insufficient systems. At some point the candidates got fed up with the non-moving queue as they only admit few people to the floor of the one storey building of the office where they effect the change. The crowd (candidates) destabilized the queue as they can no longer withstand the delay and they were seen to be pushing themselves in other to find their way in once the gate is opened. This act saw many people fainting as they rushed to the gate when opened; filling up the whole places. This act of theirs lead to stopping of the whole exercise as the staff complain been over crowded. They were speculations about the toll of those who fainted to be 10 people as ambulance was seen to be conveying those (victims) which effort in recuperating them prove abortive. While those who managed to come out of this deadly queue were seen breathing heavily with their clothes soaked. Some of the candidates who were interviewed complained bitterly about their odd experience over the exercise as many were seen to be coming from far distance with high cost of transport fee. They also use the medium to agitate for the decentralization of the exercise from Jamb office alone. While some were seen chanting the removal of the Jamb chairman Prof. Ishaq Oloyede saying he is incompetent as he made them pass through hell from this year jamb registration compare to their ages experience about Jamb. In other to relieve the crowd, one of the Jamb officials addressed the candidates on postponement of the exercise till next week; urging them to listen to radio in other to know the Computer Based Test(CBT) centres that would be allow in carrying out the exercise in other to save them money, time and stress. The Head of Media and Information for JAMB, Dr Fabian Benjamin said he learnt about crisis that occurred at the Lagos jamb office. He said correction of data and changing of course and institutions exercise is yet to commence; that the organization would inform the candidates once the exercise commence and there would be extension of the exercise as some results are yet to be released and they can also which to effect change concerning their results if they do not meet the required cut off mark for their choice of institution. He also promised to decentralized the exercise point as they (Jamb) would be using university of Lagos and Yaba College of Technology(Yabatech) for easy exercise and also to ease the crowd from coming to the office.